Excitement is building for the Charlotte MiniCon on SUNDAY, January 22, 2012! 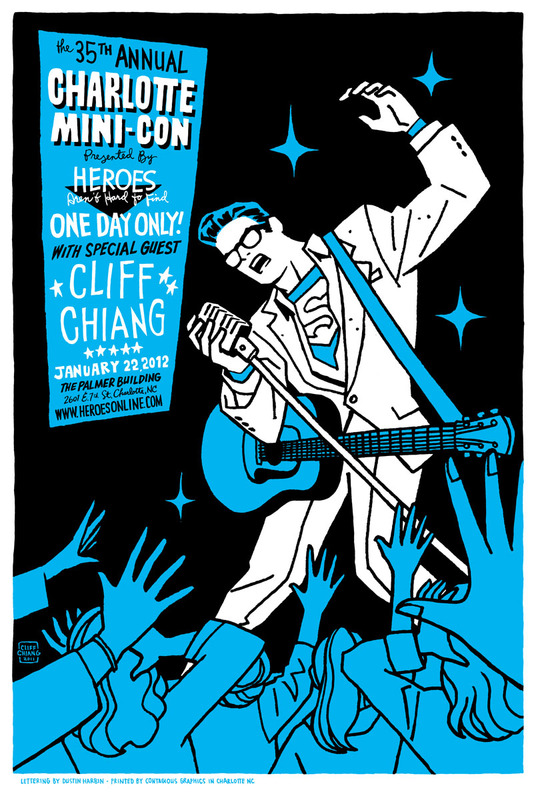 We already told you Cliff Chiang will be there but we didn’t tell you about the sweet poster we’ll be offering! Cliff and local hero Dustin Harbin have teamed up to create this gorgeous poster that will be available at the MiniCon. Did we mention it’s huge? 16 by 24 inches of glorious hand silk screened art on a nice heavy sheet of paper. Wait until you see these things! We will be offering them for a measly 10 bucks a piece! That’s a deal and a half! Get a friend to pick one up for you if you can’t make it to the show! We’ll take a closer look at all of these great creators (and maybe a couple more!) as we get closer to MiniCon time. Not only will you find great comic creators at MiniCon, the show will also feature dealers selling comics from the Golden Age through today, along with other great collectibles. If you’ve never been to the MiniCon or enjoyed the nice environment of the Palmer Building before, there’s no better time than this year. Come help us celebrate the 35th anniversary of this classic event, and make sure to bring the whole family! It’s going to be a rockin’ good time!